Discussion in 'Acquistion Targets' started by zuolun, Oct 4, 2012. Once the momentum of a stock is lost for good, rights issues have no impact on the collapse of the mother share price; they're just extra money for the listed company only. The rise and fall of AMEDIA in 2-year timeframe from baseline at low of 0.112 to historical high of 0.34 and back down to historical low of 0.095 (26 Sep 2011 to 18 Sep 2013). Are you still vested in YHS. Sold my 22 lots of YHS at 3.00 last December. These 22 lots were given div in species from my Far East Orchard. I was never vested in YHS; it caught my attention because the style the YHS's major CK played is exceptionally imprerssive. It reminds me of one CLOB share, PROMET...from a 10c stock, the major CK goreng until $10 plus and later back down to a rotten 10c stock again. 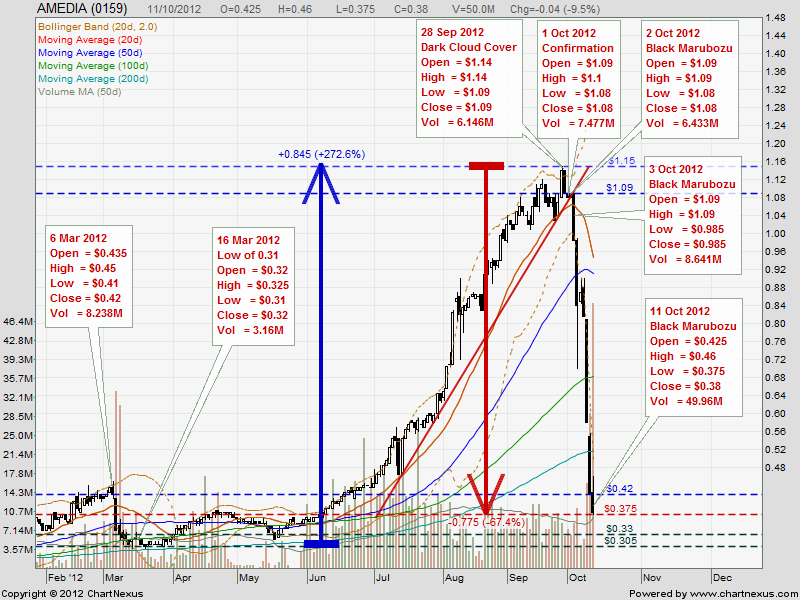 AMEDIA closed with a black spinning top @ 0.32 (-0.02, -5.9%) on 17 Oct 2012. 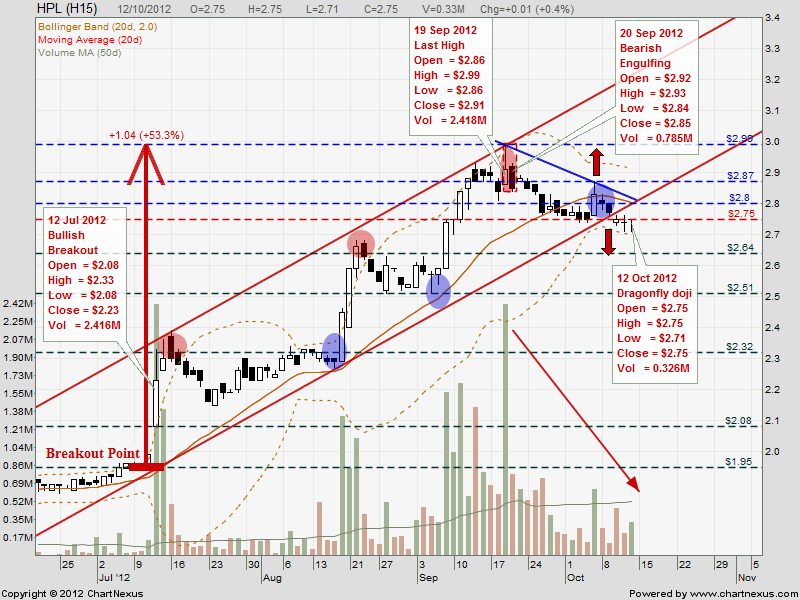 Immediate support 0.30, immediate resistance 0.35. AMEDIA — "What goes UP must come DOWN". 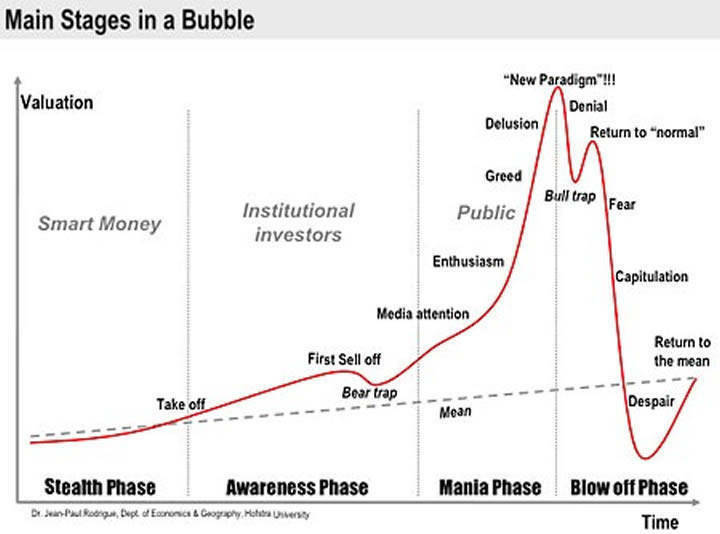 As a saying goes:"What goes UP must come DOWN". History repeats itself. The future is but a repetition of the past..."The thing that hath been, it is that which shall be; and that which is done is that which shall be done: and there is no new thing under the sun." This poem is best to describe the stock market as a bloody battlefield. While chances of winning do exist but it's not meant for everyone. In most cases, soldiers (investors) fight hard and die in the war (stock market). It's so sad that they rarely return home safe and sound, as winners. we may see a bounce back towards the upper trendline. 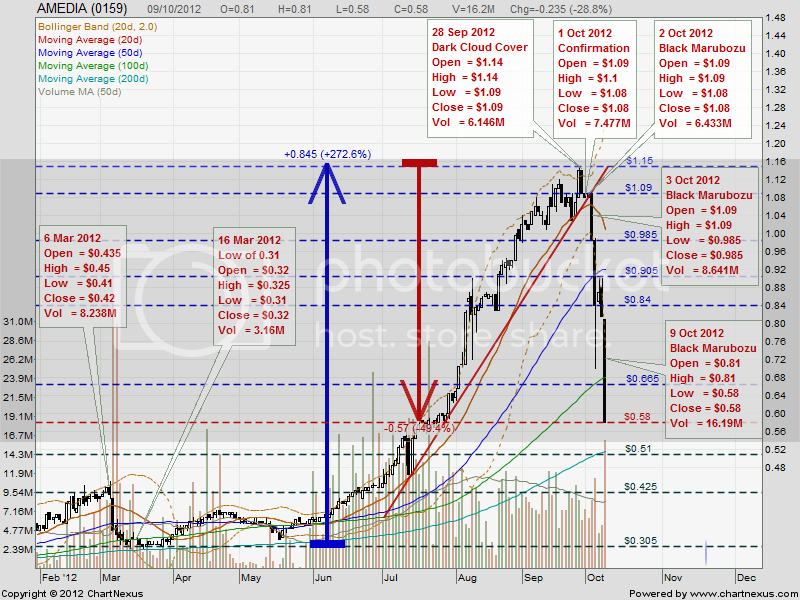 CDL closing with a black marubozu on 21 Dec 2012 is a decisive confirmation that the short-term uptrend has ended. On 28 Sep 2012, a long black marubozu 1st appeared. 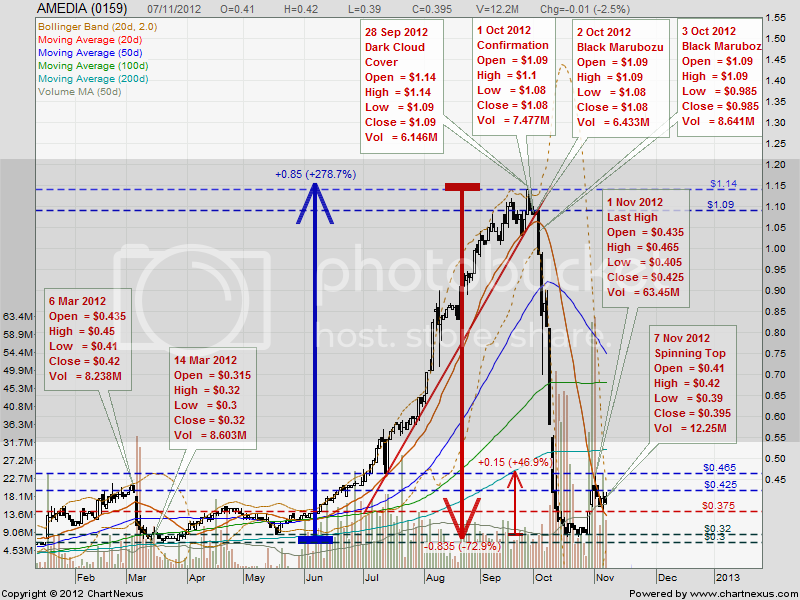 1st day — On 1st Oct 2012, bearish trend reversal confirmed by a small black marubozu. 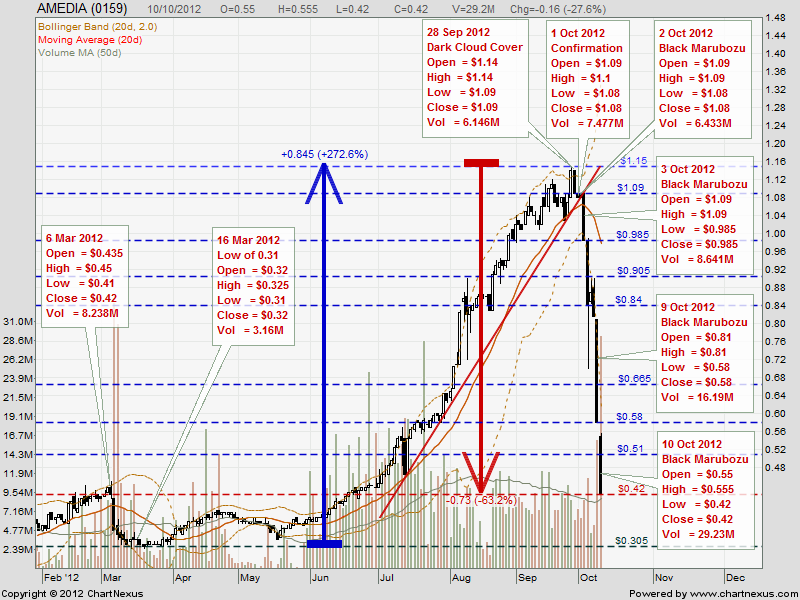 2nd day — On 2nd Oct 2012, bearish trend reversal double confirmed by another small black marubozu. 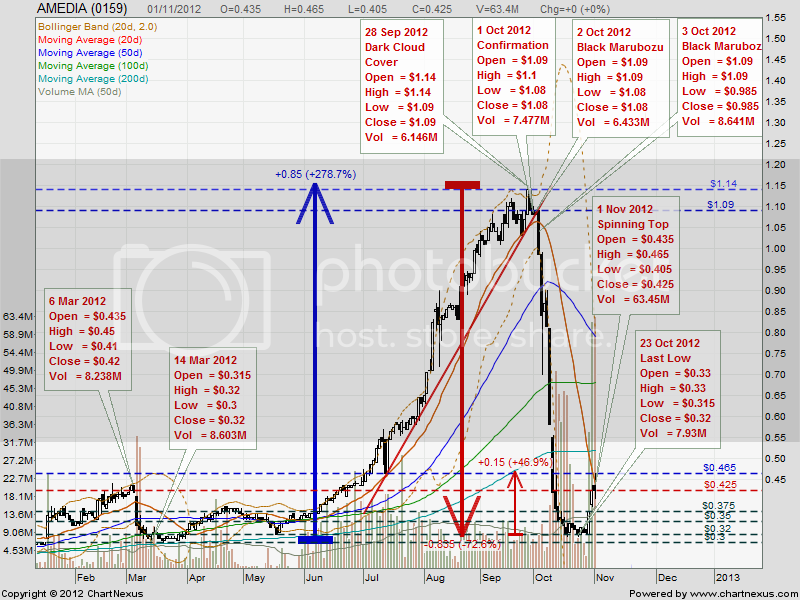 3rd day — On 3rd Oct 2012, a decisive long black marubozu signaling the end of the uptrend. 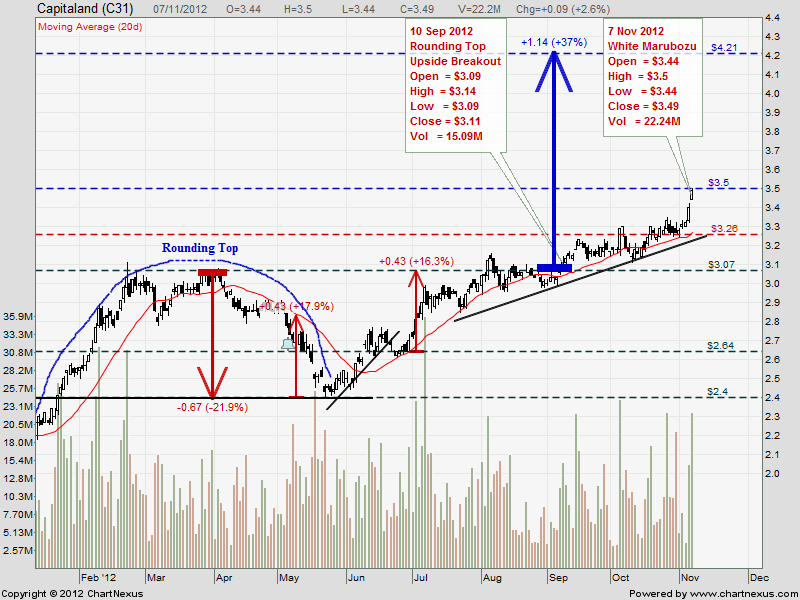 DIGI daily chart see a formation of rounding top with volume corresponding to the mirror image of the rounding top. The support is at 4.78. This formation stretched over approx 6 weeks. What is your take on DIGI? What are the conditions that will negate/invalid the rounding top formation? Or it is already confirmed? If the neckline of the rounding top @ 4.61 is taken out convincingly with exceptional high vol., it's a confirmation of a rounding top downside breakout; TP 3.77. Alternatively, if Digi could strongly rebound to hit 5.17, the 20d SMA and trades above the historical high @ 5.45 scored on 19 Oct 2012, then the uptrend resumes. 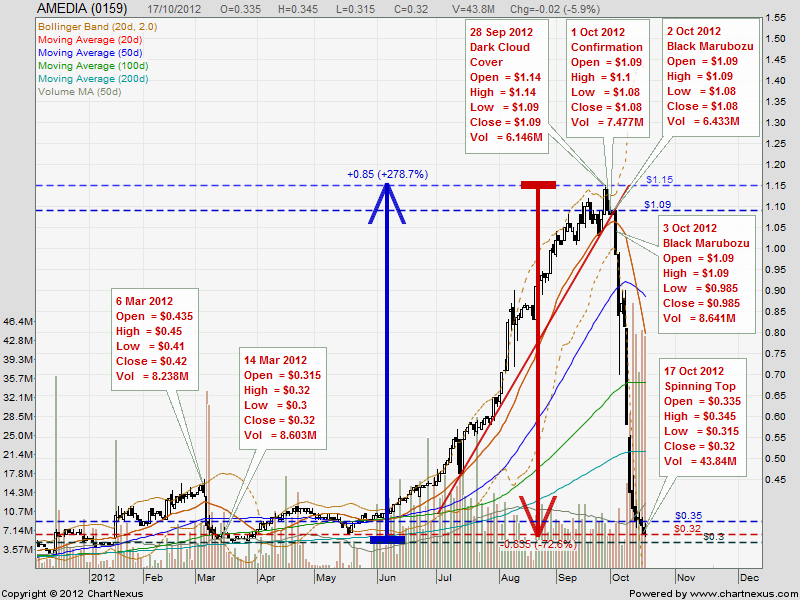 Digi closed unchanged with a spinning top @ 4.84 on 12 Nov 2012. Immediate support @ 4.78, immediate resistance @ 5.06, the 50d SMA, next resistance @ 5.17, the 20d SMA. 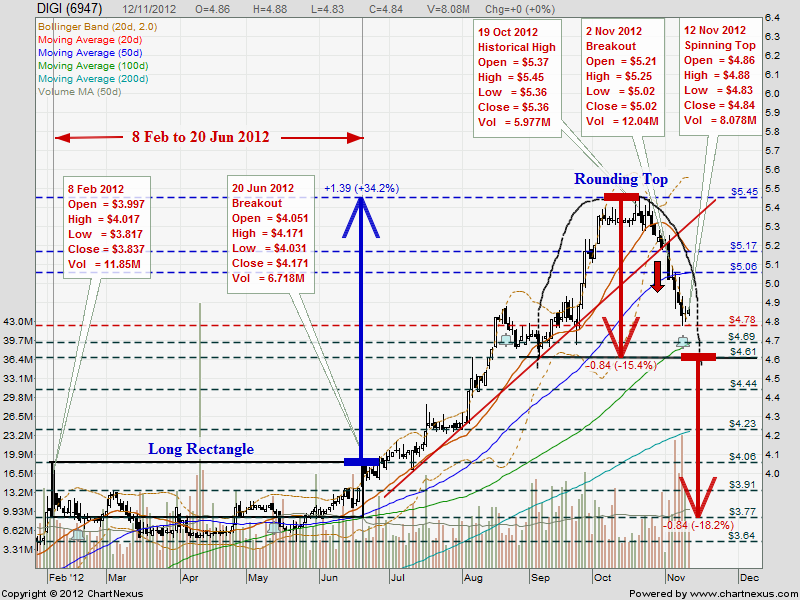 AMEDIA closed with a spinning top @ 0.395 (-0.01, -2.5%) on 7 Nov 2012. Immediate support 0.375, immediate resistance 0.425. 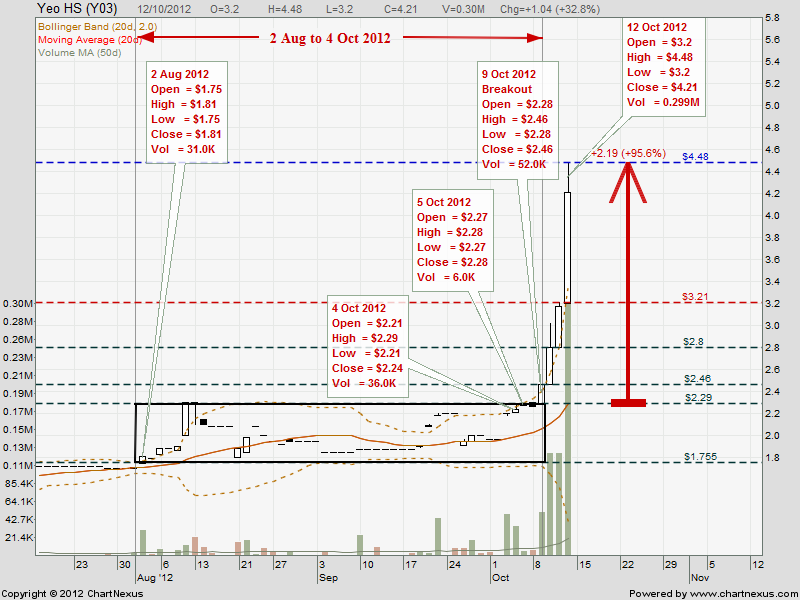 AMEDIA closed with a black hammer @ 0.35 (-0.03, -7.9%) on 12 Oct 2012. Immediate support 0.305, immediate resistance 0.375. AMEDIA closed unchanged with a black spinning top @ 0.425 on 1 Nov 2012. Immediate support 0.375, immediate resistance 0.465. AMEDIA closed with a white marubozu @ 0.345 (+0.025, +7.8%) on 18 Oct 2012. PETALING JAYA: Asia Media Group Bhd chief executive officer Datuk Ricky Wong Shee Kai has parted with 22.6 million shares in the company after selling them in the open market. “Yes. There are some (shareholding) dealings for individual capital management. It’s nothing major and it is on (the) shareholder level. Nothing related to the company,” Wong replied in a text messsage. After parting with his 9.02% stake in Asia Media on Tuesday, Wong now owns 32.43% in the company, stock exchange filings show. It is notable that Wong told StarBiz just a few days before hiving his stake in the company that he hadn’t sold a “single share” since the IPO. “I have no idea what caused the selling down. As of yesterday (last Thursday), the company didn’t receive any notification on any significant/director dealings,” he told StarBiz in a text message at the end of last week. 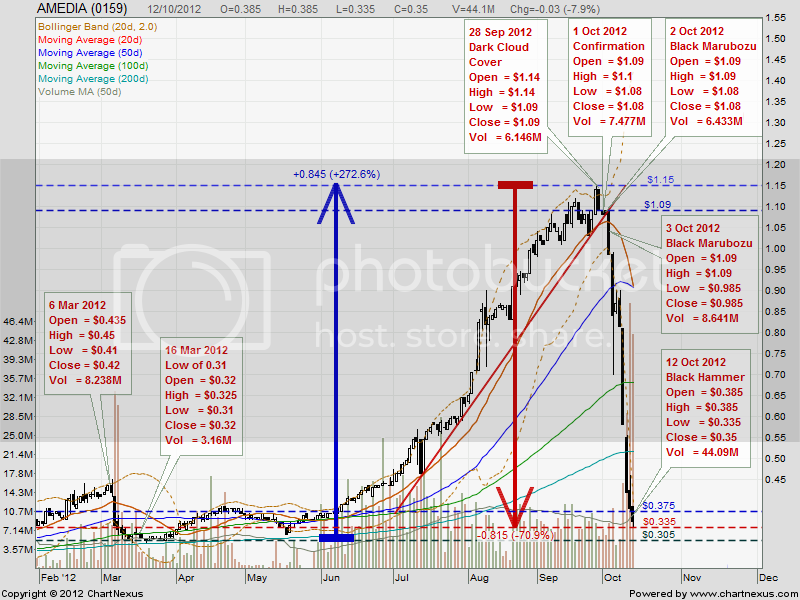 Asia Media’s shares have plunged of late from its record RM1.14 closing price on Sept 27. Fund managers had earlier attributed the share price plunge to concerns that the market for outdoor digital electronic display advertising would entail high replacement costs because it may be vulnerable to vandalism. The company’s unit, Asia Media Sdn Bhd, is a digital out-of-home transit TV company. Asia Media has 3,993 liquid crystal display screens installed on 1,800 buses travelling in the market-centric hubs of the Klang Valley and Johor Baru. Asia Media share price surged 7.81% or 2.5 sen at yesterday’s close to 34.5 sen.
PETALING JAYA: Asia Media Group Bhd, the hot stock in the news following the steep plunge of its share price by over 150% in the last few days, expects the share price to “stablise” sooner or later, said its chief executive officer Datuk Ricky Wong. He said he had no idea what was causing the drastic drop in the share price but added he was sure the panic selldown was temporary. “Unfortunately ACE market companies, being small cap, always appear to be played by certain speculators. “The company has been performing well and active, as such, it does attract many speculators,” he told StarBizWeek in a text message yesterday. He also said as a promoter and major shareholder, he had not sold a single share since the company was floated on Bursa Malaysia. 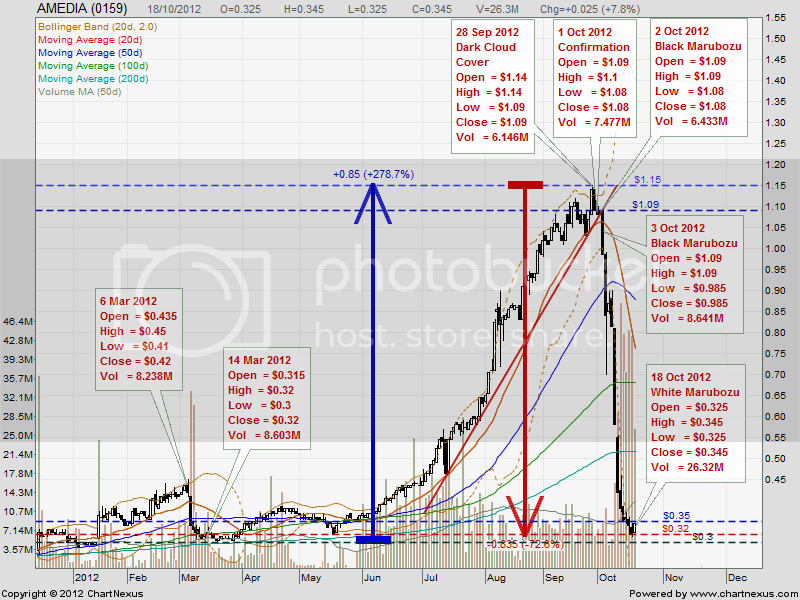 Asia Media’s shares have plunged of late from its RM1.14 record high closing price recorded on Sept 27. The share price further declined yesterday by 3 sen to close at 35 sen. Some local fund managers said it was likely that the company shares were sold down on concerns that the market for outdoor digital electronic display advertising would entail high replacement costs because of the bad habit of certain Malaysians who vandalised things placed at public places. “I know these are only a select group of naughty people but by and large we don’t have the culture of maintaining public property. “People like to damage these things to the detriment of the public at large. I don’t know what fun they find in doing such things actually. Asia Media may bear the brunt of this since they have installed so many such boards in buses,” a fund manager said. “In the bigger picture, we are rich country due to our oil money but all our money goes to replacing rather than maintaining public items properly. “It is a mindset of the public that is very tough to change. A lot of wastages will entail with such a mindset,” he added. The company was issued an unusual market activity (UMA) query in August by Bursa Malaysia in the trading of the company shares. However, the stock could gain traction moving forward given that it had applied to Bursa Malaysa and is currently waiting for approval from the relevant authorities for the proposed transfer of listing to the Main Market. Stocks on the Main Market traditionally gain more exposure with a higher market capitalisation which will qualify to enter the buying list of certain fund managers. AMEDIA closed with a black spinning top @ 0.355 (+0.005, +1.4%) on 15 Oct 2012. This is YEO HS chart..... a rather illiquid counter which saw some VERY UNUSUAL price movement on Friday. wah... what happened to it? AMEDIA closed with an inverted black hammer @ 0.38 (-0.04, -9.5%) on 11 Oct 2012. 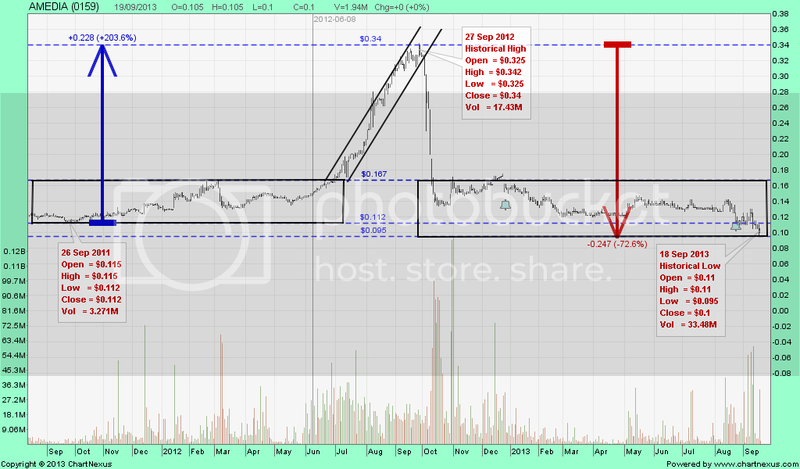 Immediate support 0.33, next support 0.305. 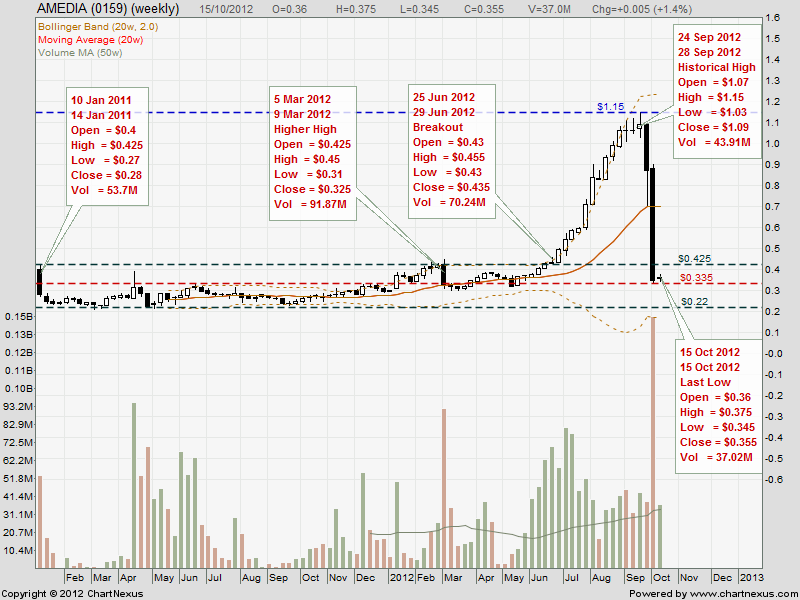 AMEDIA closed with a black marubozu @ 0.42 (-0.16, -27.6%) on 10 Oct 2012. 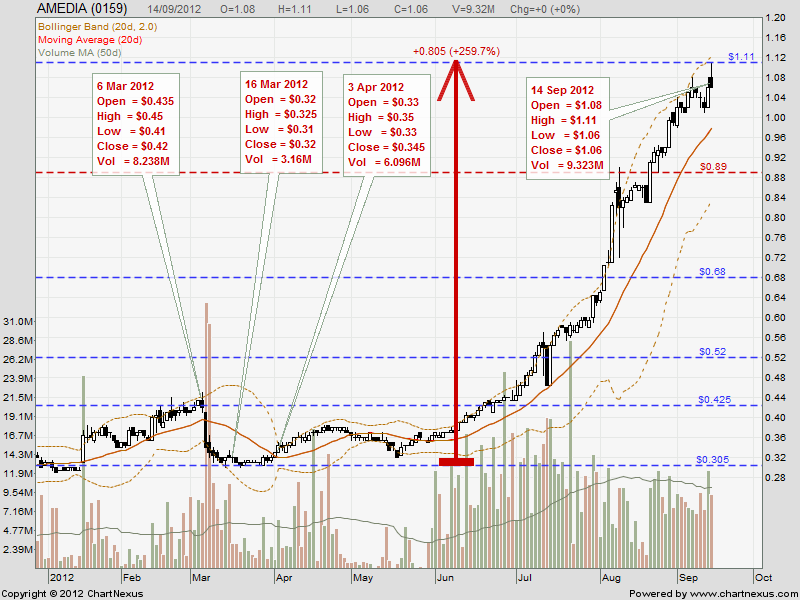 AMEDIA closed with a black marubozu @ 0.58 (-0.235, -28.8%) on 9 Oct 2012. 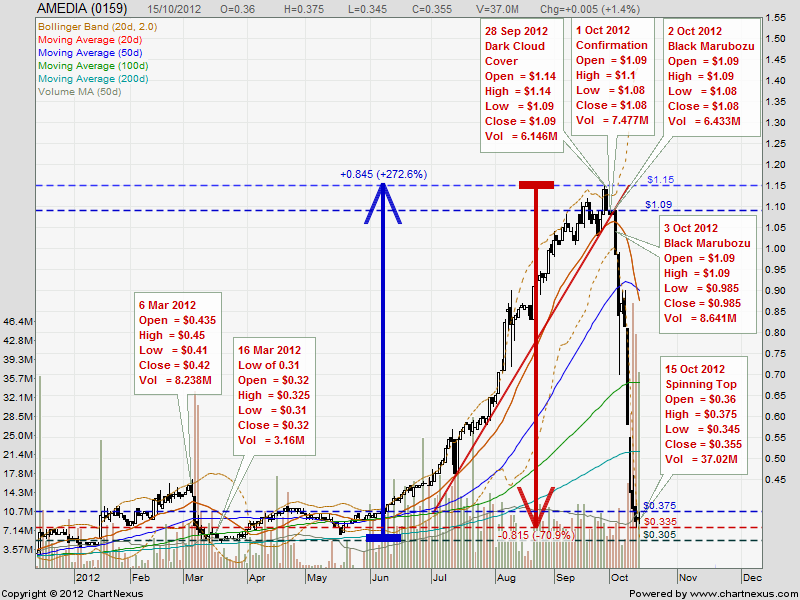 AMEDIA closed with a black hammer @ 0.84 (-0.145, 14.7%) on 4 Oct 2012. 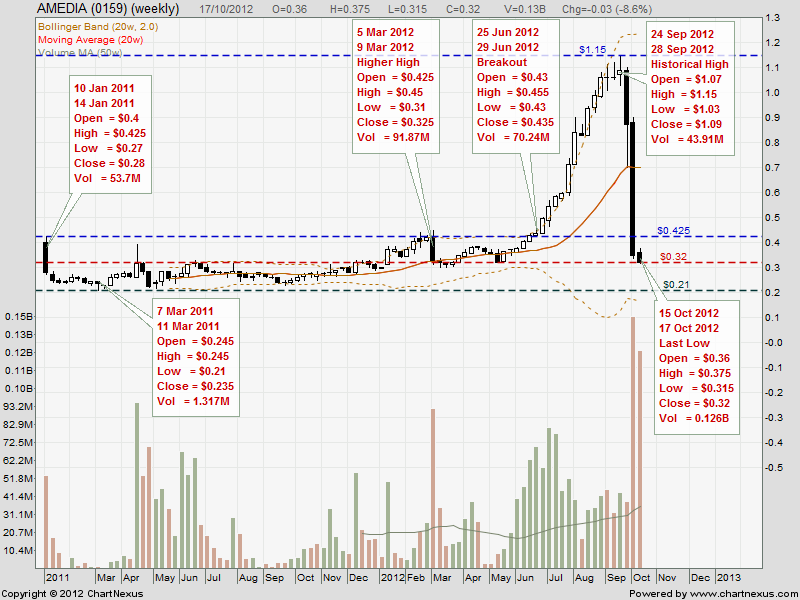 AMEDIA closed with a black marubozu @ 0.985 (-0.095, 8.8%) on 3 Oct 2012.